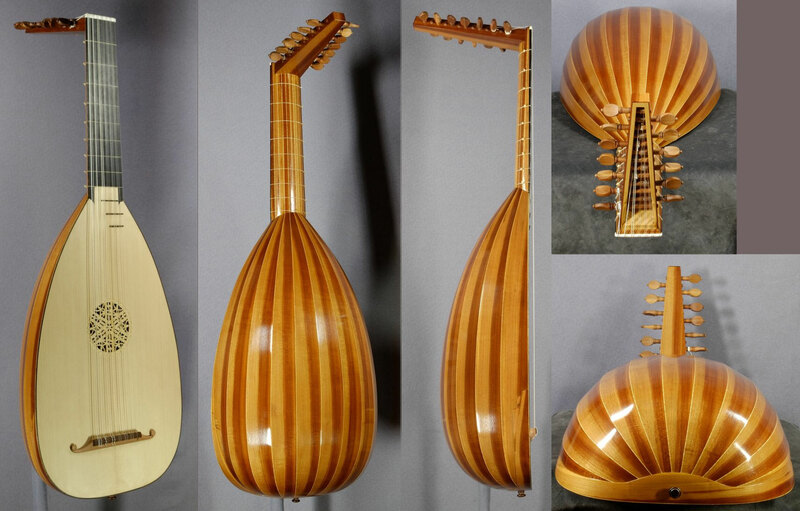 My Renaissance Lutes - urs-langenbachers Webseite! I am offering two models of renaissance lutes. The two bowls vary significantly in size, allowing for a wide range of string lengths and stringings. I have built 6-, 7- ,8- and 10-course instruments. This 7-course renaissance lute can be tested at the workshop. It has a string length of 61cm with 415 Hz pitch tuned in g'. The bowl is made of alpine yew, the filets separating the ribs continue onto the veneered back of the neck. The top is made from native spruce cut by myself. It has a gilded rosette. 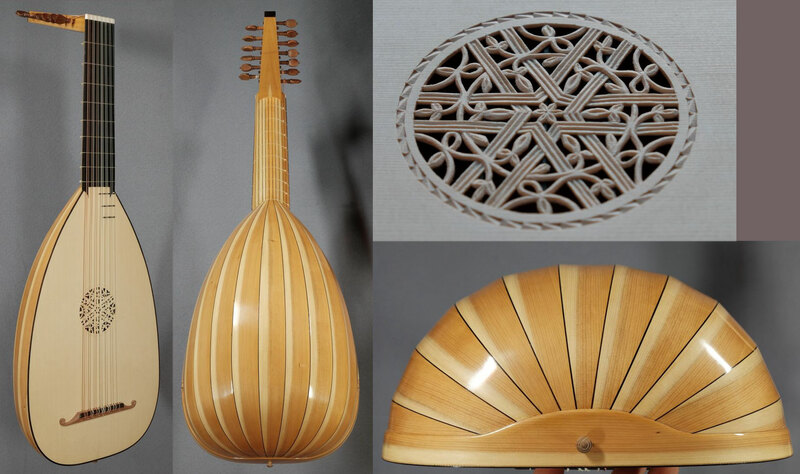 This 7-course renaissance lute has a string length of 66cm with 440 Hz pitch tuned in e'. The neck has 9 frets. The bowl is made of alpine yew with rosewood filets, the top is made of native spruce cut by myself. This model has the same stringing as the one above but the bowl is made from different timber. It is made of American Cherry showing colour change between center and sapwood. I am also using rosewood for the bowl. 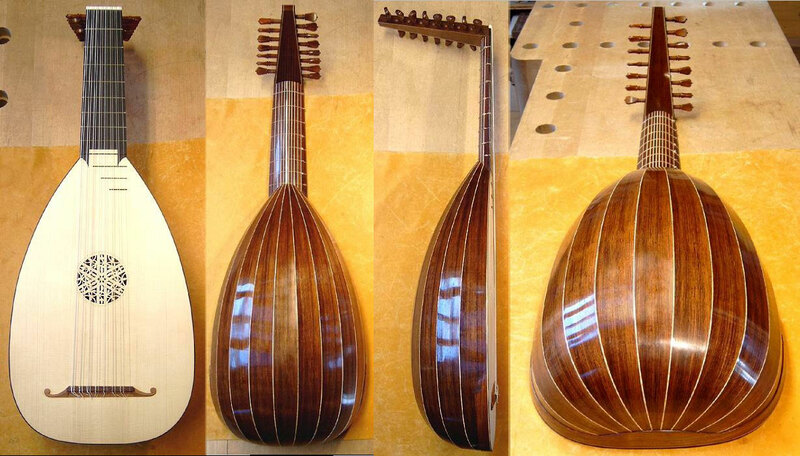 Here you can see an 8-course renaissance lute with a string length of 63cm, pitch of 415 Hz tuned in g'. This interpretation of an instrument owned by the "Kunsthistorisches Museum" in Vienna was presumably a 7-string instrument earlier on. 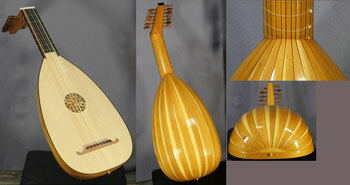 It has a 66,8cm string length with 415 Hz pitch tuned in e'. The bowl is made of alpine yew, the top made of native spruce.